four proposed 2015 to 2020 year vehicles. 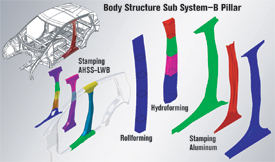 General results include a new benchmark in weight reduction achieved through AHSS optimized structures, enabling power-train downsizing for affordable electrified vehicles; a portfolio of innovative steel solutions that apply to a full range of electrified or internal-combustion-engine vehicles; and a new design methodology to realize the best environmental solution for compliance with future vehicle-emission regulations. The FSV is achieving its results through the use of a broad range of available steel grades and a design-optimization process that develops non-intuitive solutions for structural performance, including optimized shapes and component configurations. FSV’s steel portfolio is utilized during the material selection process with the aid of full vehicle analysis to determine material grade and thickness optimization. The design and development process was expedited, we learned, by use of the Accelerated Concept to Product (ACP) process developed by Engineering Technology Associates, Inc. (ETA), Troy, MI. The ACP process incorporates the Heeds Professional software package from Red Cedar Technology, Inc., which allows FSV developers to automate the design-optimization process. Thus, they’re able to quickly and efficiently analyze such a wide variety of forming options. Shaw noted some 30 different materials and 19 process variations being reviewed by the FSV team, alerting attendees to a “mass paradigm shift” in the vehicles will be developed in the near future. Among the advanced high-strength steel features of the F-150 are a hydroformed front-end, low-pressure hydroformed dual-phase 780 roof rail, boron hot-stamped B-pillar reinforcement and high-strength side rails. Here’s a partial list of presentations from GDIS 2010, available for download on demand at www.steel.org. • FutureSteelVehicle—Jody Shaw, United States Steel Corporation; Harry Singh, EDAG; and Akbar Farahani, Engineering Technology Associates, Inc.
• Lightweighting Automobile Body– Enablers and Manufacturing Challenges—Dan Grieshaber, General Motors Co.
• Advanced High-Strength Steel Technologies in the 2010 Ford Fiesta— Shawn Morgans, Ford Motor Co.
• Economics of Lightweighting Steel Wheels through Flow-Forming—Erik Waelchli, IBD Connection, Inc.
• Investigation of Tooling Durability for Advanced High-Strength Steels—Tareena Mulholland, General Motors Co.